This Posi Lock 11058 puller center bolt is made of steel for strength and durability, has a 3/4" diameter, and is suitable as a replacement center bolt for use with Posi Lock 110 and 210 pullers. The center bolt provides counter pressure in external pulling applications. The diameter of the center bolt must be at least half the diameter of the shaft along which the object is pulled. 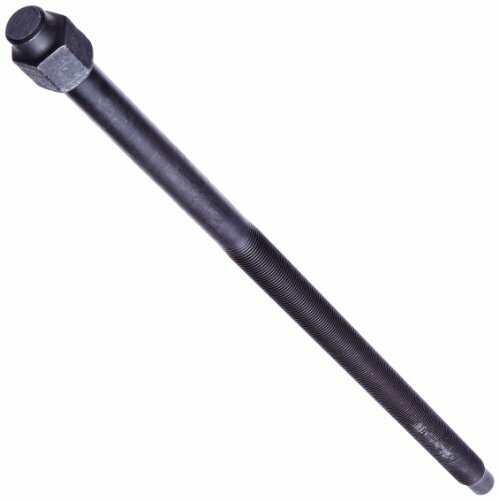 This center bolt is suitable for extracting shaft-fitted parts in a range of industries, with an appropriate puller. Gear and bearing pullers are tools designed to remove mechanical, press-fit parts, such as bearings, bushings, gears, and pulleys, from a shaft, or to remove a shaft from inside a hole. Pullers have three main parts—the center bolt, gripping jaws, and T-handle—and can be operated manually or hydraulically. The jaws of the puller form a claw that grips the edge of the gear, which is pulled off the shaft when the screw is turned. Pullers are typically configured with two or three jaws and can be constructed of iron, steel, or other alloyed metal. Pullers can be used manually or can be powered by a hydraulic cylinder, adding speed and precision, and reducing the physical labor required for pulls. With a hydraulic puller, compressed air is forced through the cylinder by a pump that is either connected by hose to the puller or is integral to it. Pullers are used in hundreds of applications in the automotive, agricultural, and manufacturing industries, among others. Posi Lock manufactures pulling jaws, vises, and specialty tools. The company, founded in 1978, is headquartered in Cooperstown, ND. If you have any questions about this product by Posi Lock Puller, contact us by completing and submitting the form below. If you are looking for a specif part number, please include it with your message.